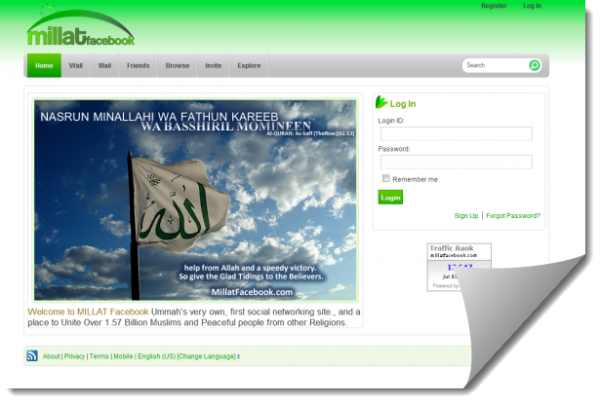 Pakistan gets its own Facebook - The MILLAT Facebook! Pakistan gets its own Facebook – The MILLAT Facebook! Ever since Pakistan banned several sites including Facebook, Twitter, etc, Pakistanis have been looking forward to an alternative to network online! It is a site run for Muslims, by Muslims … but “sweet people from other religions, are also welcome to join in“, it says on the website. MillatFacebook.com is Pakistan’s very own, first social networking site and has been launched by six young IT professionals from Lahore. The Urdu word “Millat” is used by Muslims to refer to their nation. The above image is from that post. This post now appears to have been removed! This new anti facebook site will never fly. Certain Muslims will still become upset with other social networking sites, irregardless of whether they are members or not. I’ve yet to hear extremists from other religions being very upset with facebook, so they’re probably not going to get many non Muslims. Are we going to see Facebook suing this new site for the use of the trademarked word Facebook in it’s name? Mark Zukerberg’s FB which took YEARS to develop and ran as a prototype for years. Than was registered in 1997 and it wasn’t until a YEAR LATER in 1998 that they could formally launch it. The most reputable internet stats provider Alexa Ranked MFB 18,860th site out of over 6 BILLION WEBSITES within JUST One and a Half week. The FB which took 6 years to gain popularity. Join this Group “United against Facebook’s ridiculing Prophet (P.B.U.H) Islam & now Holy Quran. I hope you will do this , it takes not more then 2 minutes or 5 minutes if you have very slow internet connection. MFB is ONLY social networking site in the world where more than 2/3 rd of the users spend OVER 2 Hours which is pretty unique. This site is based on phpfox software. Anyone can a site within few hours using the phpfox script.